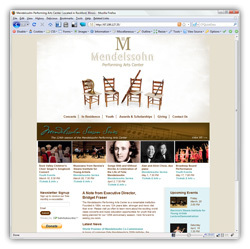 Mendelssohn Performing Arts Center's web site has officially been redesigned and re-launched. The Mendelssohn Performing Arts Center "provides quality music for people of the Rockford area through live performances by local and world renowned artists." Using the power of Adobe® ColdFusion® along with CSS, XHTML and Microsoft® SQL Server, I was able to bring Jaci M.'s sophisticated design to life. The site features a fully integrated secure shopping cart with payment processing via PayPal. The "all-in-one" customized cart solution accommodates tickets, subscriptions and dues. The site also features a comprehensive back-end to allow for easy maintenance of concerts, venues, subscription packages, performing artist dues and more. Looking to Integrate Your ColdFusion eCommerce Application With PayPal? If you develop any ColdFusion eCommerce applications, you will eventually run into a client who prefers to use PayPal™ or would like to offer PayPal as a payment option. I thought it might be useful to offer a few helpful insights and links. You'll need new credentials before going live which would be generated by the actual client's account. By the way, if you're going with Express Checkout and you're using ASP, .NET, PHP, JSP, or Java SDK, you've got to see their new Integration Wizard which generates the code for you. It's pretty slick. Wish they had one for ColdFusion though. Now that you've traversed some of the areas of PayPal, here's the golden nugget ... visit the downloads area of the PayPal Developer Center. There you'll find a .zip file that contains working sample code (in ColdFusion!) for most implementations which covers Website Payments Pro and the ever-popular Express Checkout. Hopefully this helps get you started in the right direction for your next PayPal integration with your ColdFusion eCommerce application.